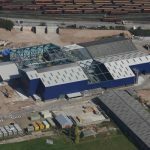 Fairport Engineering Ltd of Adlington, Lancashire has been working on the Lynemouth power station conversion project, since 2016, as the main contractor’s, SRM, specialist materials handling engineer and designer thus allowing this land-mark project to benefit from the combined strengths of both organisations. 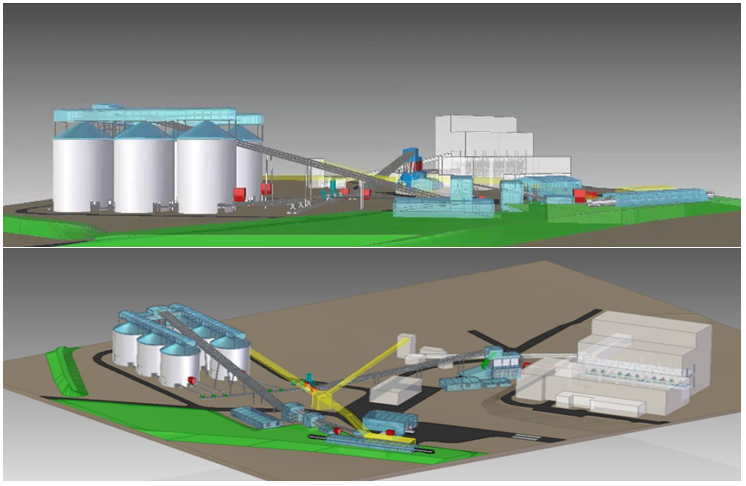 This major multi-million pound project is totally focussed on replacing the previous fuel (coal) handling and storage systems with a new regime that will be suitable for biomass (wood pellets) and achieved constructional completion during the second half of 2018. 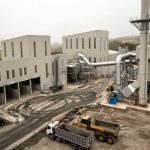 Major design & build projects for solid fuel power stations are nowadays the exception rather than the rule here in the UK and so it is appropriate to use this article to show the transition of this project from concept to reality. In order to ensure security of supply Lynemouth is able to accept biomass fuel by two means – rail and road. Rail is the predominant means of delivery and the station is provided with biomass wood pellets by a dedicated rail spur that can receive up to four 2,000t trains a day from a specialised bulk store constructed at Port of Tyne. As will be observed from the following photographs adjacent to the rail unloading facility are three road vehicle unloading stations. Having been unloaded the fuel pellets are then transported by a twin, air supported, belt conveying system to the main station storage silos. The six concrete slip-formed silos are fitted with a Fairport designed bottom to encourage mass flow and are also inter-connected by drag link conveyors in such a manner that the storage silos can operate on a FIFO (First In First Out) basis. As will be noted, and expected, each of the main storage silos are fitted with explosion panels and slam-shut valves to protect the silos and their contents. 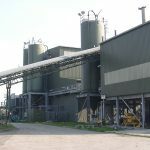 Once having been extracted at a controlled rate from the main storage silos the biomass fuel pellets are, once again, transported to the intermediate silos by a twin, air supported, belt conveying system. The intermediate storage silos hold the pellets prior to them being fed into 12 individual dense phase conveying systems to reach the grinding mills that will pulverise the pellets before being injected into the boiler burners. Lynemouth has three boilers and each is served by four mills each of which has four dedicated dense phase conveying systems, one of which is a hot standby.